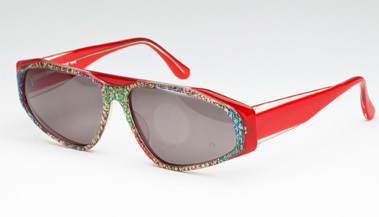 We have hunted down a collection of more than 2000 famous and not so famous designer glasses. They are all unworn, originals, not a copy in sight. Our selection includes both timeless and fantasy frames and ranges from 1940s Bohemian Pantos round frames, to oversized shapes from the 70s, not forgetting the ultra-feminine butterfly models from the 50s and 60s. Most were handcrafted in the Jura mountains, which has been the heart of French spectacle manufacturing since the 19th century. For our lenses we work with Mont-Royal, a manufacturer at the forefront of optics technology that is based in eastern France. Their high-performance lenses are thin and very discrete. In our quest for a unique product that has passed the test of time we defend traditional values of authentic skilled craftsmanship. You won't see our glasses on everyone's nose. Optique Durable has reinterpreted the creative process by recycling materials and upholds ecologically responsible consumption and production. 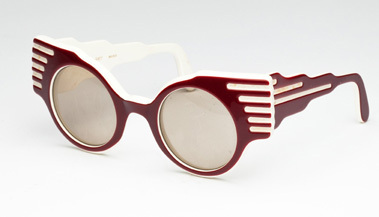 Committed to contemporary creativity, we lend many frames to film-makers and performance artists. Our shop also has an on-going exhibition of art works by alternative designers from creative poetic worlds. More about the shop’s style. Finally, we work with musicians in their search for a stage image. Our shop is close to Place de la Bastille. You first enter a vintage-style space leading to our workshop – where our craftsmen are busy – before reaching the shop itself. If you haven’t already seen glasses being restored, this is your chance. At Optique Durable, the restorer's skill is a living exhibition, alongside the glasses and the works of art. What if I break my glasses ? For two years after the purchase, if you break your frame accidentally, we will repair it free of charge. And if the frame can't be repaired ? Optique Durable will replace the frame free of charge for 6 months after purchase with an identical or equivalent model that doesn't require a new set of lenses. After six months, a 50% fee will be applied. What if I'm not satisfied with my corrected vision ? There is a two-month lens adjustment period. If your vision is uncomfortable, we will modify your equipment. What if I just can't get used to my progressive lenses ? We will offer to replace them with two pairs of glasses: one to correct your distance vision and the other for reading. What if my prescription is out of date ? We will give you an eye test and update the prescription. Just ask! We can adapt the lenses to any model. What if I want different coloured or multi-coloured lenses ? We can do that in our workshop: fuchsia, emerald, duck yellow, or rainbow if you like. What if I already have a vintage frame that needs adapting ? If your grandfather's or grandmother’s spectacles are perfect for you or if you found your dream frame in a flea market, we can renovate them and replace the lenses. What if I'm afraid of losing my glasses ? you are after all a sustainable optician ? If you need a spare pair: For every frame bought with a pair of corrective lenses, for one extra euro we can provide you with a second set of corrective lenses for your old glasses (lens treatments and thin lenses are possible but cost more). If you never want to see your old glasses again: You can trade in your old glasses for a 30 to 50% discount on the new frame. These offers cannot be combined and the discount cannot exceed 100 euros off the purchase price of a model in the shop (frame and corrective lenses). Do you have flexible payment schemes ? We offer interest-free payment in three or four instalments by bank card (see conditions in the shop). 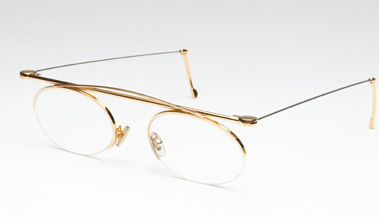 If you are looking for authentic vintage frames in Paris Bastille, Optique Durable should be number one on your list ! 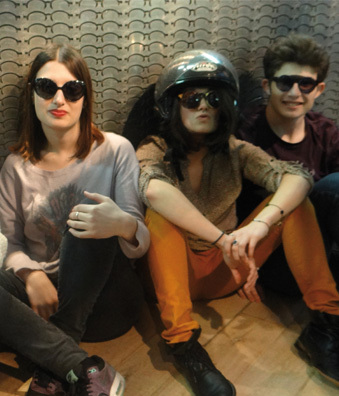 You can find retro eyewear in the Bastille area ! The best optician in Paris ! Eyeglasses, sunglasses, we have everything you need ! We also repair and look after your eyewear! Corrective and progressive lenses are also available. They have been enchanted by our large choice of frames : Charlie Winston, Marion Seclin, Guillaume Naturel, Sophie-Marie Larrouy, Stanislas Zanko, Cédric Leroux, Fred Le Chevalier and Laurent Godard who has collaborated with us for the design of original eyewear : les flatteuses, by Flatteurville ! Don’t hesitate any longer, come to Optique Durable !